I drove to the range yesterday to send some lead down range after work. After I arrived I realized I’d brought the wrong magazines. I’ve been keeping sets of magazines in ziplock containers. Can you tell the difference? Clearly I could not. 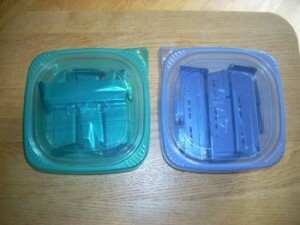 One of these had 4 double stacked XD magazines, the other has 5 single stack 1911 magazines. 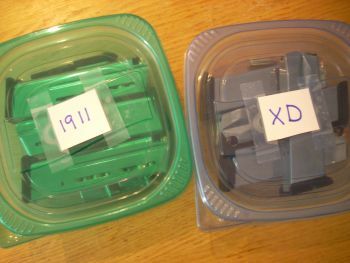 I brought a container of 1911 magazines with the Springfield XD9. Bummer. I did not shoot on this visit. How did I manage to do this? I’ve been drinking from the fire hose in my quest to learn and haven’t slowed down to regroup. In this case I should have dumped out my gun bag after the 1911 Take Down class I took last weekend and inventoried what’s in the bag. So what’s the good news? I now have enough guns that I’m fortunate enough to have this problem. (I try to stay positive!). This should work much better! I treat every visit to this range as an opportunity to talk to knowledgeable folks and learn. Two of the guys that I see the most in the afternoons had walked me through taking my magazines apart a few weeks back on a slow day. I followed up yesterday with a final question about the direction to place the small end of the spring in the follower. II’d taken them apart and cleaned them up, then took my best guess at putting them back together. I even shot a match with them last weekend and all seemed to go well, but I still wanted to confirm my technique. Since I hadn’t brought the right mags with me this trip, he was kind enough to pop a similar mag out of a rental gun to examine. He let me take it apart and show him the two options. He confirmed my choice was correct. Alignment on the left is correct: it’s vertical when flush in the follower. Alignment on the right is wrong: it angles to the right of vertical. The new Silicon cloth for magazine maintenance. I picked up a silicone cloth to “lubricate” my magazines. In a recent class I attended I was advised that these cloths were the best way way to keep magazines working well. First take them apart and wipe off the dirt and grime with a clean dry cloth. Then run this silicon cloth through the inside of the magazines, around the outside edges of the follower, and up the spiral of the spring. The cost was roughly $5. And one the guys at the shop reminded me: don’t put them in the washer. He said you’d be surprised at how many people do that, then realize: “no more silicon“. And finally, I stopped in to see the resident gunsmith. We are becoming fast friends. He has already fixed a serious issue for me and never seems to tire of my endless questions. I’ve been waiting 4 weeks to get the slim grips we ordered for my new 1911. He called this week and was told they are on back order. So I asked if we could order from a different supplier. 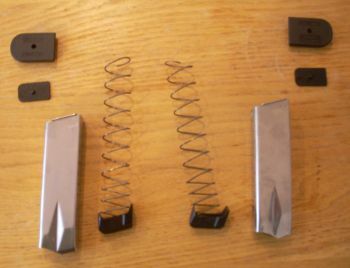 Turns out he has a dozen or so slim options in stock, but had not mentioned that as he thought I wanted the specific grips I originally selected. I’m so glad I asked. He has several I’d be happy with, so I’ll be taking the 1911 to him next week and finally get the gun set up to shoot. All in all a productive trip, even if I didn’t get to shoot. This entry was posted in Magazines, Mistakes by Sadie. Bookmark the permalink.